In this week’s episode, Robert and I discuss how much digital marketing you can really buy for the price of a Super Bowl ad and whether or not that’s a fair comparison. Next, we ponder Gary Vaynerchuk’s launch of three branded hub websites with major consumer product sponsors, and ask some important questions about the business model he plans to employ. Finally, we dissect the thinking behind LinkedIn’s decision to discontinue the enterprise marketing tool set it purchased from Bizo, and The Wall Street Journal’s decision to drop LinkedIn from its sharing buttons. Rants and raves include John Hagel’s sage advice on serving as a trusted adviser to your customers and why Buffer decided to stop focusing on building its email list. We wrap up the show with a #ThisOldMarketing example from Foley Engines. What $5 million can buy in digital media (6:30): Every year, marketing pundits ask themselves the question: “Is the Super Bowl worth it?” At a price tag of $5 million for 30 seconds of airtime, it’s a good question, especially when you consider what you can get for that money in digital. I don’t buy into the idea behind this article, because Super Bowl viewers are a captive audience; digital media audiences are not. Robert is flabbergasted that a start-up company like Apartments.com could invest 5% of its revenues in a Super Bowl ad, yet most marketers struggle to get support to spend a fraction of that on content marketing. Gary Vaynerchuk gets into the publishing business (17:42): Internet entrepreneur and agency CEO Gary Vaynerchuk is building three new content hubs that are “independent” but backed by brands including Axe and GE. One of the publications is Axe’s Magnifier magazine. It will cover style, grooming, culture and relationships for the Millennial man. Robert and I agree this isn’t something new or innovative; it’s very similar to old-school custom media. We discuss one unanswered question that will be the key to whether or not this new venture is successful. 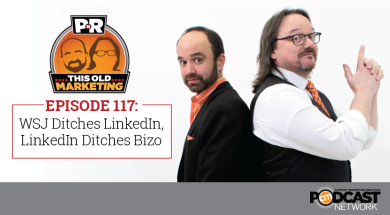 LinkedIn ditches Bizo integration (25:30): LinkedIn has admitted it failed to accurately forecast the resources required to scale the B2B ad-targeting platform it acquired from Bizo in 2014. It plans to terminate the offering, according to CMS Wire. This acquisition led to the short-lived creation of its Lead Accelerator product, which LinkedIn officials said they will phase out in the first half of this year. Robert believes LinkedIn found that scaling an enterprise software business solution proved to be too difficult, and so it decided to cut its losses. This article is paired with the following one. Wall Street Journal removes LinkedIn sharing button (26:38): Publishing Executive has reported that The Wall Street Journal has removed its LinkedIn sharing button from its article pages. It’s easy to understand why WSJ would want to stop enabling the free flow of content onto LinkedIn’s platform. LinkedIn is competing with WSJ to attract the attention of senior business professionals. The article also points out that LinkedIn articles get many shares, but not as many page views as they would have expected. I looked at CMI’s numbers, and found the same pattern. AdStation: It’s hard enough growing a large and loyal group of fans who follow your content. But what’s even harder, is finding a way to make money from those users — to advertise to those users without driving them away. It’s tough, and it takes a delicate touch. This week, we have a case study from Prime Publishing, a content publisher with over 6 million subscribers that used AdStation to send targeted, weekly advertising to its subscribers. It’s a fascinating example of how to make money from your content in a safe and effective way. You can read the Prime Publishing case study here: http://bit.ly/adstation-case-study. Robert’s raves: Robert loves this thought-provoking interview with renowned business strategist John Hagel III on The Marketing Journal blog. In it, Hagel reveals the fundamental changes that must happen for a business to become truly customer-centric. This involves intelligent use of data to deeply understand the needs of your customers and become a trusted adviser to them. In other words, he’s promoting the idea of realigning your company’s business model around content marketing and creating valuable experiences for your customers. It’s a fascinating read! Joe’s rant & rave: This article on the Buffer blog by Kevan Lee caught my attention this week. 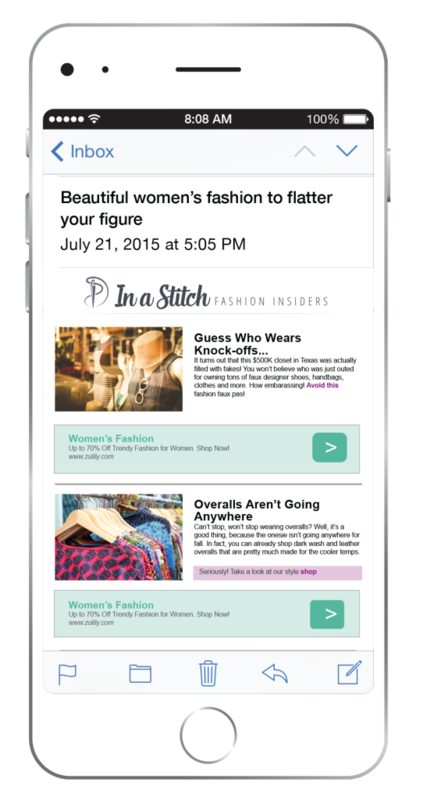 In it, he explains why his company is no longer trying to grow its email list. Instead, all of its calls to action are now focused on product sign-ups. I love the honesty of this article, but I’m shocked that Buffer doesn’t have a plan for what to do with its email list of more than 44,000 people. I outline the questions the company needs to ask about its subscribers to determine their potential value and a strategy to cultivate more value from them. Foley Engines: Foley Engines, located in Worcester, Massachusetts, is the oldest engine distributor in North America. Founded in 1916, this family-owned, third-generation business specializes in marine and industrial engines, replacement parts, marine transmissions, industrial power takeoffs, and exhaust scrubbers/purifiers. The first thing you notice when you visit the company’s website is its focus on content, not products. A reference to the Ask Dr. Diesel blog is prominently displayed on the home page. 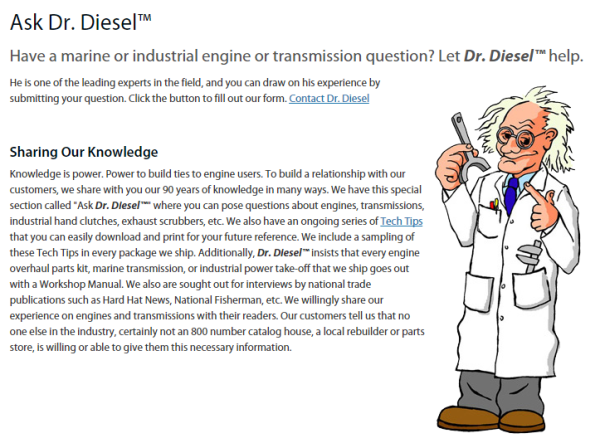 This is a knowledge-sharing service, which enables customers to ask technical questions related to diesel engines, which it answers in detailed technical blog posts. The website also contains extensive lists of Tech Tips and how-to videos. Robert wrote to Dr. Diesel, who quickly replied to him – in character – and provided more details about Foley’s customer-centric approach. In the last year, the company has published more than 200 technical tips for mechanics and equipment owners. Robert closes with an amusing anecdote Dr. Diesel shared that speaks to Foley’s total devotion to its customers. It’s a fantastic example of #ThisOldMarketing.